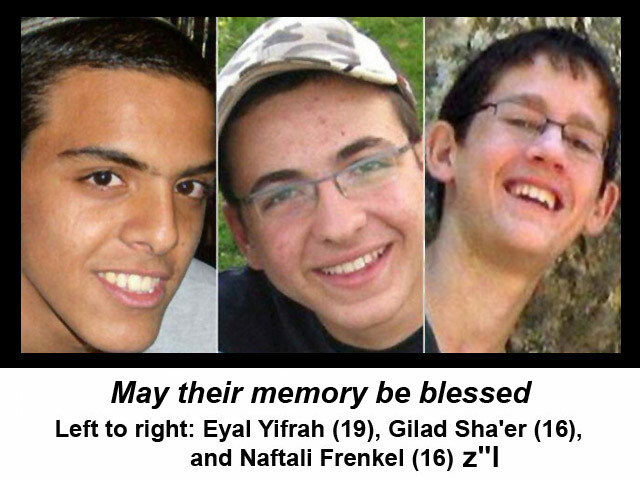 Following extensive searches led by the Israel Defense Forces, the Israel Security Agency and the Israel Police, the bodies of Eyal Yifrach (19), Gilad Sha’er (16) and Naftali Frenkel (16), who were kidnapped by Hamas terrorists on June 12, 2014, were discovered today in the area northwest of Hebron. A community memorial service will be held today, July 1st at 6:30 p.m. at Congregation Mikveh Israel, 44 North 4th Street, Philadelphia. All of us, who for the past 18 days have been hoping and praying for the boys’ safe return home, grieve today along with their families. In the name of the whole of Israel, I ask to tell the dear families — to the mothers, the fathers, the grandmothers and the grandfathers, the brothers and sisters — our hearts are bleeding, the whole nation is crying with them. For 18 days we hoped and prayed with one voice that we would find the boys safe and well. With this bitter news all of Israel mourns their deaths. Along with our deep sense of loss we remain committed to bringing the terrorists to justice. Our resolve in the fight against terror will only strengthen and we will ensure that murderous terrorism of this sort will not dare to rear its head again.